This is a healing headstone - a pattern of prayer links the headstone with an adjacent holy well, pray on your knee's before the headstone, score a cross onto the stone and then, still on your knees, crawl to the holy well 150m to the west. This lovely holy well site has done the research on Fr. McCarthy and details the strength of devotion to him and the many cures attributed to him. 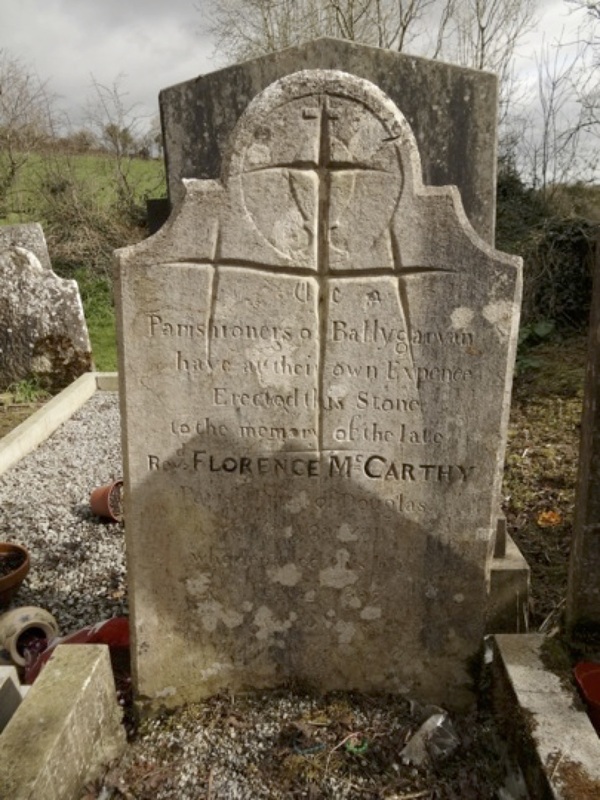 If any readers know any more about this Florence McCarthy please email john@historicgraves.com. About 1 in 100 graveyards have a curing or healing stone inside it, mostly associated with priest's graves. We'll cover more of these in coming weeks. And most of these healing stones are still in use today - it seems like superstition but only when one has experienced serious illness in a family can one understand what drives us to fall back on the old ways.